It's a bull with a unicorn horn on it, naturally. The bull has long been the symbol of Wall Street – hyper-masculine and aggressive. We think it's frankly hilarious that anyone thinks a snorting, charging, macho animal provoked to the point of aggression is really a symbol of success or good business practices. So we've reclaimed the bull by adding a unicorn horn. Adorbs! Yes, we know that bulls are male animals. We also just like to f*** with gender norms. In day-to-day usage, bullicorns are determined, intelligent feminists who are motivated to succeed in their careers. Some of us are freelancers or entrepreneurs, but most of us have a more traditional daily grind. 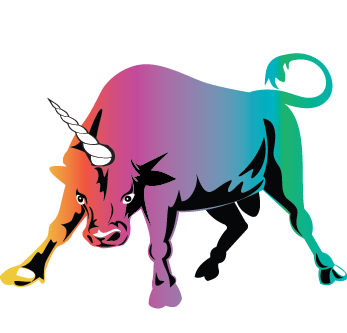 Regardless of the industry or type of work, bullicorns are supportive, social justice-minded individuals with the drive to succeed.